The 1st of January, Easter Monday, May 1st (May Day), May 8th (VE Day), Ascension Day (Thursday), Whit Monday, July 14th (Bastille Day), August 15th, November 1st (All Saints), November 11th (Armistice Day) and December 25th (Christmas). On legal holidays, banks, government offices, shops, the majority of businesses and also many museums and tourist attractions are closed. 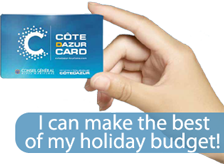 Credit cards are accepted in many shops, hotels and restaurants (there is usually a minimum amount of between €7 and €15). For cash, you will find cash-points on just about every street corner (24 hours a day). Bank branches, exchange bureaux and some post offices handle currency exchange transactions and traveller's cheques. Whatever you are buying, prices are net. A gratuity is however the custom in restaurants and for certain specific services (taxi cabs.). - You are strongly recommended to respect smoking/no smoking signs in public places. - It is always useful to have a little cash on you at all times for little out-of-pocket expenses like taxi fares to the airport, drinks, etc. - If you are driving, park only where authorised and respect speed limits on highways and motorways. - Owing to a number of major events (the Cannes Film Festival, the Monaco F1 Grand Prix) or conferences, it may be difficult to find accommodation. You are strong advised to book very early.